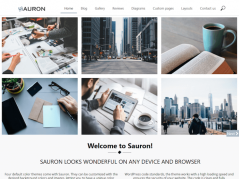 The ever-increasing demand for photography themes has encouraged WordPress design companies to focus on delivering innovative and feature-loaded photography themes/templates. If you’re operating a WordPress photography website, you’d be definitely familiar with the sheer amount of WordPress themes that are available for photography and portfolio websites. 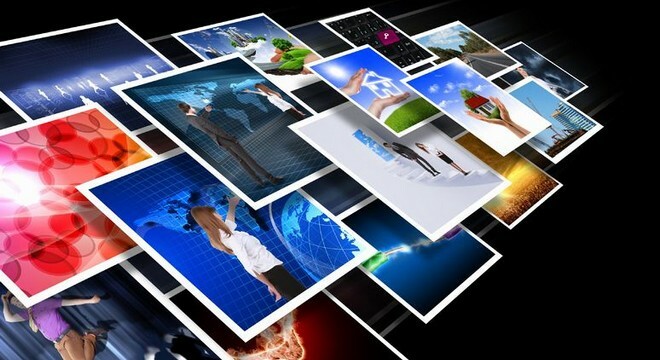 Choosing the perfect theme for your WordPress photography site appears as a challenging task for numerous website owners. 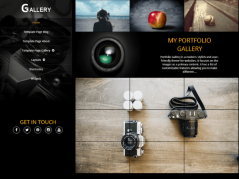 This blog of mine serves as a handy guide for all such individuals who’re unable to spot the right theme for their photography portal. Here, I’ve jotted down details about 10 eye-appealing themes specially designed for photography web portals. DeepFocus is a simple and elegant theme that allows you to showcase your work with a touch of professionalism.This amazing WordPress theme comes with features viz: shortcodes, galleries, full-width homepage slider, boxed layouts, full-width layouts, responsive design and many more. 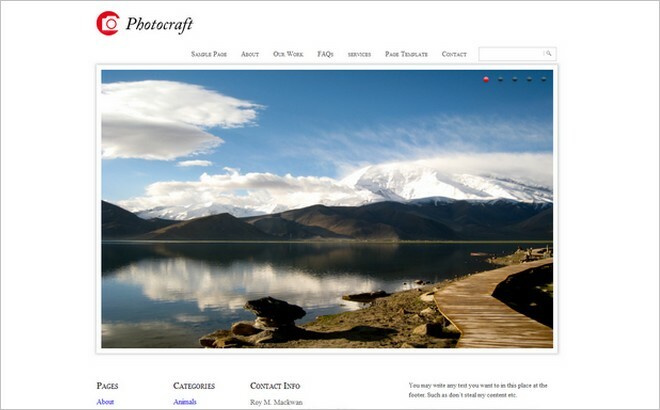 Designed by Templatic, Photocraft is an amazing WordPress photography theme that is meant for photography websites. This simple to use WordPress theme comes with easy to customize footer, useful sidebars, customizable header, Gravatar support, five different page templates, cross-browser compatibility and built-in monetization options. As a fully-responsive WordPress theme, Glare is just the right fit for photographers who want to show off their work with style.Equipped with a super slider, Glare allows you to add amazing effects into your photography website. Moreover, you can easily choose to add a header background to every post and page. Other brilliant features of this WordPress theme include: Google Maps Integration, Widgetized footer, large homepage slider, two stunning gallery styles and many more. 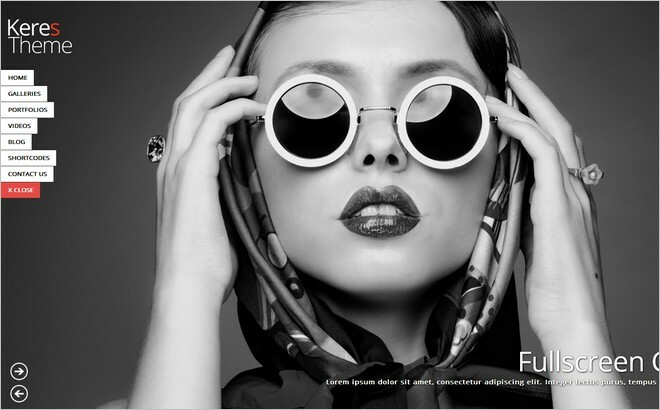 Focal is yet another fully responsive WordPress theme especially designed for photographers. 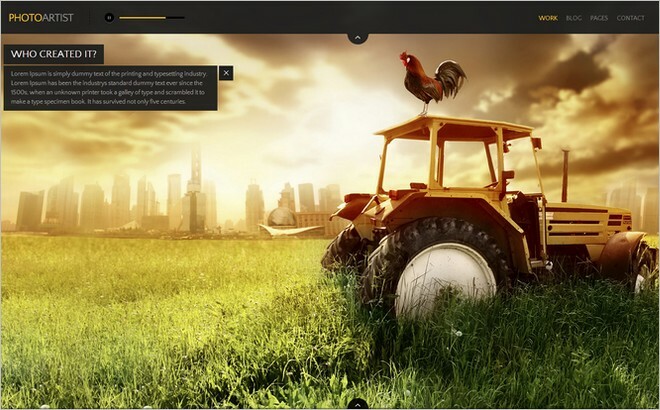 With a simple homepage, this theme contains a beautiful full-page slider. Focal comes with a clean and minimalist design that enables you to keep your readers engaged to your website. Some incredible features of this WordPress theme include: filterable gallery, responsive design, gallery manager, custom widgets, easy social media integration, full loading pages and many more. 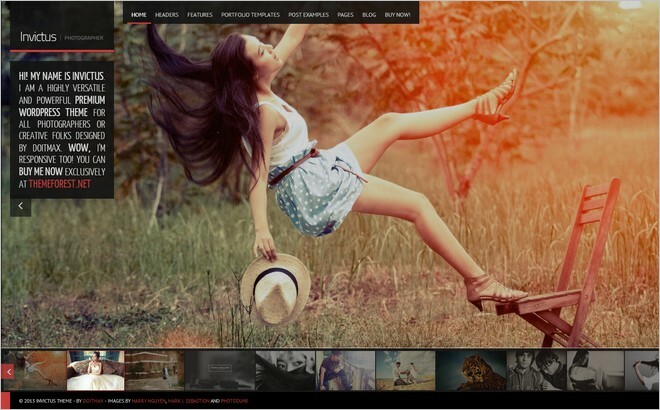 Invictus is a fabulous WordPress theme specially suited for photo gallery and portfolio websites. The homepage slider is one of the most stunning features of this theme. Other interesting features of this WordPress theme include: 10+ portfolio layouts, enchanting galleries, three different navigation options, HD Video playback, self-hosted videos and many more. As a graceful WordPress theme, Photoartist comes with a large homepage slideshow and some really cool thumbnails. 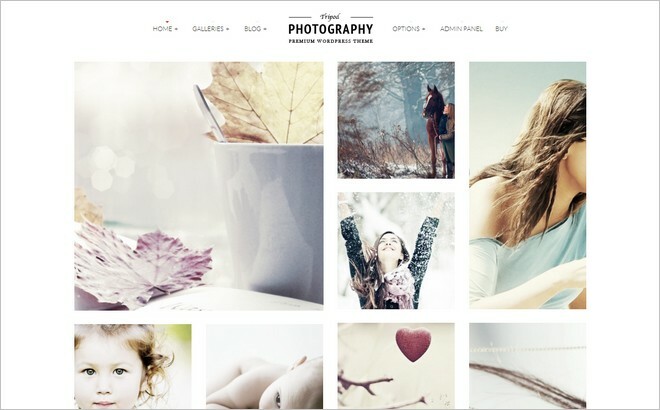 This lightweight theme comes as a perfect match for photography and portfolio websites. Features of this WordPress theme include: a Fuse framework, portfolio slider, custom fonts, fully responsive design, custom fonts, cross-browser compatible and many more. 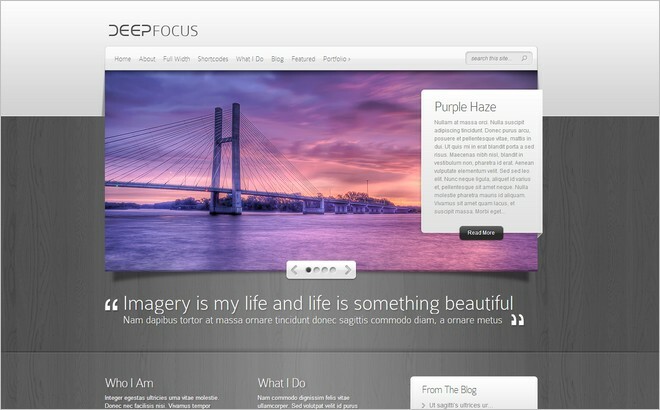 Keres is a fabulous WordPress theme suited for photography websites. Features such as SEO Optimized code, custom shortcodes, large homepage slider. Skin manager, music playback, responsive layout and easy social media integration make Keres a perfect fit for websites that need to showcase work in an eye-catchy manner. Backed by more than 50 advanced shortcodes, this WordPress theme has everything that’s required for improving your site’s overall look and feel. 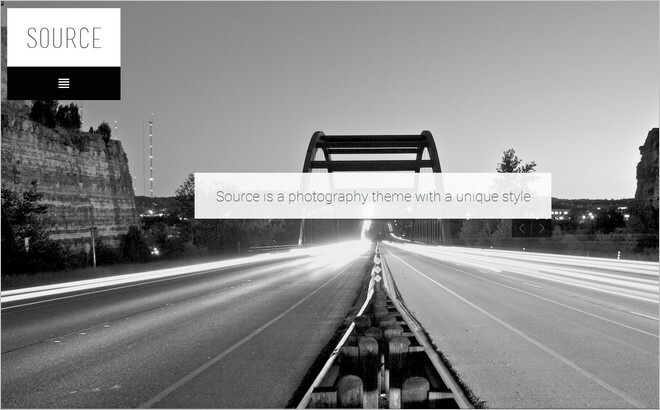 Source is a fully responsive WordPress theme suitable for every photographer who wants to present his/her work in a stylish way.Equipped with a unique style and presentation capability, Source lets people understand your work. Some interesting features of this WordPress theme include: Homepage slider, Music playback, SEO Optimized code, Google Maps Integration, responsive design, tons of shortcodes and many more. 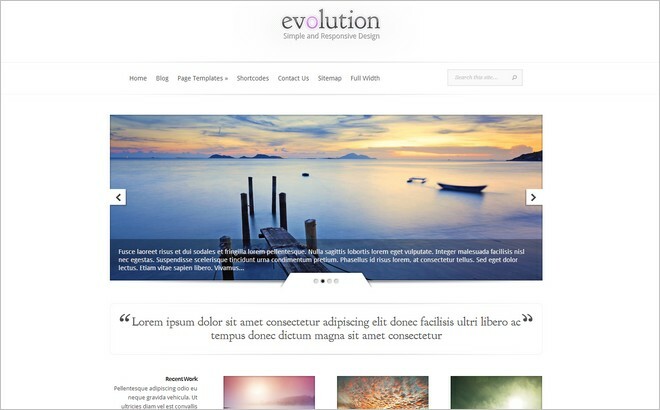 WordPress theme, Evolution comes with great display functions for photography websites. Responsiveness is the greatest strength of this WordPress theme. 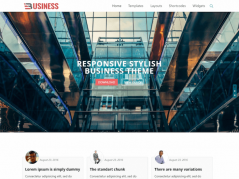 Other incredible features of this theme include: responsive design, tons of shortcodes, numerous page templates, SEO optimized code, several different color schemes, theme options and many more. The highly customized nature of Evolution makes it a perfect match for every photography website. Tripod is an advanced photography WordPress theme that not only comes with an amazing design but even includes some cool effects and functionalities. Eye-catchy features of this theme include: flashy animations, retina-ready display, social media ready, WooCommerce supported, Responsive design, numerous gallery types, tons of widgets and many more. Now you’ve seen them all, the 10 finest Photography WordPress themes that have the potential of keeping your visitors engaged on your site. Hope you’d have loved the collection and found a pick for your photography website. Please do share your views/opinions on the above post. For this, you may use the comments box below. Rick Brown is associated with a leading Mobile Applications Development Company – Mobiers Ltd. Get in touch with him, to hire the best Mobile App Developers for optimum results and productivity. Get in touch with him at Facebook, Twitter and Google Plus.